What’s the most important economic statistic to gauge a society’s prosperity? I often use per-capita economic output when comparing nations. But for ordinary people, what probably matters most is household income. And if you look at the median household income numbers for the United States, Obamanomics is a failure. 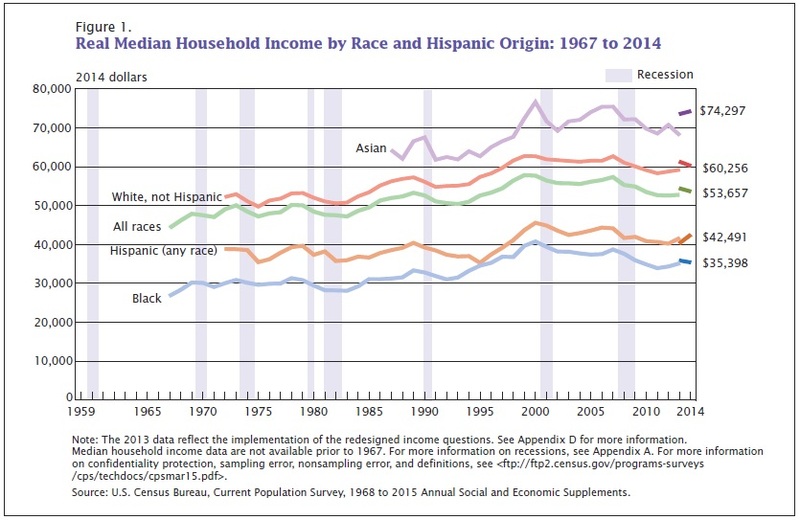 According to the Census Bureau’s latest numbers, the average family today has less income (after adjusting for inflation) than when Obama took office. In an amazing feat of chutzpah, however, the President is actually arguing that he’s done a good job with the economy. His main talking point is that the unemployment rate is down to 4.7 percent. Yet as discussed in this Blaze TV interview, sometimes the unemployment rate falls for less-than-ideal reasons. Since I’m a wonky economist, I think my most important point was about long-run prosperity being dependent on the amount of labor and capital being productively utilized in an economy. 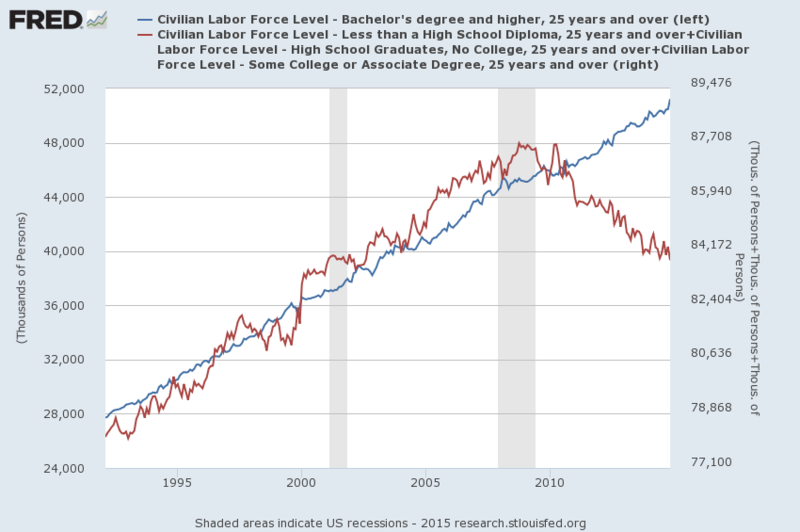 And that’s why the unemployment rate, while important, is not as important as the labor force participation rate. 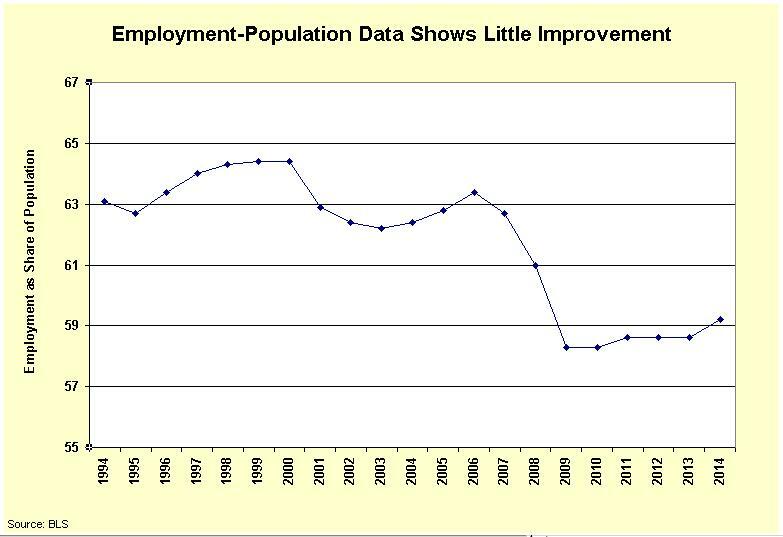 Here’s the data, directly from the Bureau of Labor Statistics. As you can see, the trend over the past 10 years is not very heartening. To be sure, Obama should not be blamed for the fact that a downward trend that began in 2008 (except to the extent that he supported the big-government policies of the Bush Administration). But he can be blamed for the fact that the numbers haven’t recovered, as would normally happen as an economy pulls out of a recession. This is a rather damning indictment of Obamanomics. My jaw almost hit the floor. This is a White House that promised the unemployment rate would peak at only 8 percent and then quickly fall if the so-called stimulus was approved. Yet the joblessness rate jumped to 10 percent and only began to fall after there was a shift in policy that resulted in a spending freeze. In effect, the President airbrushed history and then tried to take credit for something that happened, at least in part, because of policies he opposed. One final point. I was asked in the interview which policy deserves the lion’s share of the blame for the economy’s tepid performance and weak job numbers. I wasn’t expecting that question, so I fumbled around a bit before choosing Obamacare. But with the wisdom of hindsight, I think I stumbled onto the right answer. Yes, the stimulus was a flop, and yes, Dodd-Frank has been a regulatory nightmare, but Obamacare was (and continues to be) a perfect storm of taxes, spending, and regulatory intervention. And even the Congressional Budget Office estimates it has cost the economy two million jobs. Let’s dig into the issue of whether the United States should become more like France. In a 2014 study for the National Bureau of Economic Research, Stanford University’s Robert Hall wrote about America’s sub-par economic performance. His opening line was basically a preemptive refutation of Obama’s claim – made during the State-of-the-Union Address – that the economy is strong. The years since 2007 have been a macroeconomic disaster for the United States of a magnitude unprecedented since the Great Depression. I don’t know that I would use “disaster” to describe the economy. That word would be much more appropriate for failed welfare states such as Italy and Greece. But Professor Hall was definitely correct that the U.S. economy has been sputtering, as illustrated by comparative business-cycle data from the Minneapolis Federal Reserve. So what accounts for America’s anemic economy? Hall has about 50 pages of analysis, but since brevity is a virtue, let’s look at some of what he wrote in his final paragraph. Labor-force participation fell substantially after the crisis, contributing 2.5 percentage points to the shortfall in output. The decline showed no sign of reverting as of 2013. …an important part may be related to the large growth in beneficiaries of disability and food-stamp programs. Bulges in their enrollments appear to be highly persistent. Both programs place high taxes on earnings and so discourage labor-force participation among beneficiaries. The bulge in program dependence…may impede output and employment growth for some years into the future. In other words, he pointed out that a large number of people have left the labor force, which obviously isn’t good since our economy’s ability to generate output (and boost living standards) is a function of the degree to which labor and capital are being productively utilized. 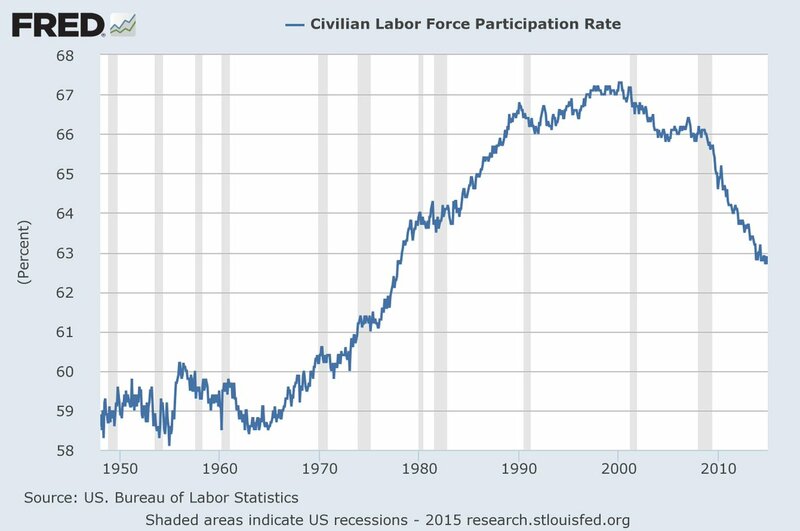 And his work suggests that redistribution programs are a big reason for this drop in labor-force participation. Now let’s look at another study from NBER, this one from 2015 that was authored by economists from the University of Pennsylvania, University of Oslo, and Stockholm University. They examine the specific impact of unemployment insurance. We measure the effect of unemployment benefit duration on employment. …Federal benefit extensions that ranged from 0 to 47 weeks across U.S. states at the beginning of December 2013 were abruptly cut to zero. …we use the fact that this policy change was exogenous to cross-sectional differences across U.S. states and we exploit a policy discontinuity at state borders. We find that a 1% drop in benefit duration leads to a statistically significant increase of employment by 0.0161 log points. In levels, 1.8 million additional jobs were created in 2014 due to the benefit cut. Almost 1 million of these jobs were filled by workers from out of the labor force who would not have participated in the labor market had benefit extensions been reauthorized. Wow, that’s a huge impact. To be sure, I’ll be the first to admit that empirical work is imprecise. Ask five economists for an estimate and you’ll get nine answers, as the old joke goes. Professor Hall, for instance, found a smaller impact of unemployment insurance on joblessness in his study. But even if the actual number of people cajoled back into employment is only 500,000 rather than 1 million, that would still be profound. Though at some point we have to ask whether it really matters whether people are being lured out of the labor force by food stamps, disability payments, unemployment insurance, Obamacare, or any of the many other redistribution programs in Washington. What does matter is that we have a malignant welfare state that is eroding the social capital of the country. The entire apparatus should be dismantled and turned over to the states. But not everyone agrees. You probably won’t be surprised to learn that the White House is impervious to data and evidence. Indeed, notwithstanding the evidence that the left was wildly wrong about the impact of ending extended unemployment benefits, the White House is proposing to expand the program. Here’s some of what’s being reported by The Hill. The president’s three-pronged plan includes wage insurance of up to $10,000 over two years, expanded unemployment insurance coverage… The plan comes on the heels of Obama’s final State of the Union address on Tuesday, in which he committed to fighting for expanded out-of-work benefits during his last year in office. …The plan would also extend benefits to part-time, low-income and intermittent workers who can’t already take advantage of the out-of-work programs. And it would mandate states provide at least 26 weeks of coverage for those looking for work. The part about mandating that all states provide extended coverage is particularly galling. It’s almost as if he wants to make sure that no states are allowed to adopt good policy since that would show why the President’s overall approach is wrong. I joked in 2012 about a potential Obama campaign slogan, and I suggested an official motto for Washington back in 2014. Perhaps we should augment those examples of satire with a version of the Gospel according to Obama: Always wrong, never in doubt. A few days ago, we used supply-and-demand curves to illustrate how taxes reduce economic output. Supply-and-demand curves also can be used to examine the impact of minimum wage laws on the labor market. Workers understandably will be willing to supply more labor at higher wages. Employers are just the opposite. They demand more labor when wages are low. But as you can see from the chart, if politicians impose a minimum-wage mandate above the equilibrium level, there will be unemployment. Some folks, though, may not be overly impressed by theory. So how about empirical research. Other folks, though, may prefer real-world examples rather than academic studies. We’ve already looked at the bad results when the minimum wage was increased in Michigan. Now we have some more unfortunate evidence from the state of Washington. Seattle Magazine has a story about a bunch of restaurants closing because of an increase in the minimum wage. The article starts by noting a bunch of eateries are being shut down. Last month—and particularly last week— Seattle foodies were downcast as the blows kept coming: Queen Anne’s Grub closed February 15. Pioneer Square’s Little Uncle shut down February 25. Shanik’s Meeru Dhalwala announced that it will close March 21. Renée Erickson’s Boat Street Café will shutter May 30… What the #*%&$* is going on? Hmmm…so what’s changed. It’s not higher food prices. It’s not a change in dining preferences of consumers. Instead, government intervention is having a predictable effect. …for Seattle restaurateurs recently, …the impending minimum wage hike to $15 per hour. Starting April 1, all businesses must begin to phase in the wage increase: Small employers have seven years to pay all employees at least $15 hourly; large employers (with 500 or more employees) have three. Since the legislation was announced last summer, The Seattle Times and Eater have reported extensively on restaurant owners’ many concerns about how to compensate for the extra funds that will now be required for labor: They may need to raise menu prices, source poorer ingredients, reduce operating hours, reduce their labor and/or more. 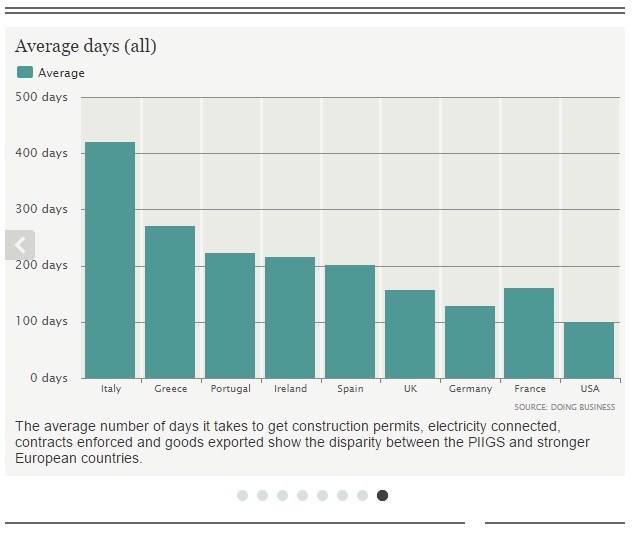 An industry expert tries to explain the new reality of coping with higher costs. Well, we know what “the new world will look like” for many workers. They’ll be unemployed. So you can understand why this issue is so frustrating. Politicians posture about helping workers, but they wind up displaying their economic ignorance and real-world innumeracy. And innocent people pay the price, as shown in the Branco cartoon. P.S. Walter Williams explains the racist impact of minimum-wage laws. P.P.S. 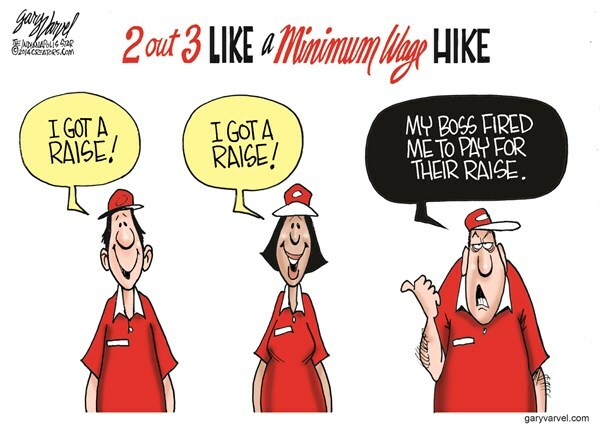 On a lighter note, here are a couple of additional clever cartoons illustrating the negative impact of minimum-wage mandates. P.P.P.S. And this video is a must-watch on the issue. P.P.P.P.S. Shifting to a different topic, I’m not quite sure this guy deserves to be in the Moocher Hall of Fame, but I’m glad he’s going to jail. Champion golfer Alan Bannister, who played off a handicap of seven, was convicted of benefits fraud after being caught on camera walking around the course on his daily game. He even had a taxpayer-funded mobility car by claiming he was in too much pain to walk. …Inspectors discovered he used his mobility car – intended for people “virtually unable to walk” – to drive to the golf club to play with the “Sunday Swingers” and “The Crazy Gang” players, despite claiming he could barely walk 50 metres at a time. …The court was told Bannister dishonestly claimed £26,090.55 from 2007 until 2012 in Disability Living Allowance. And while he’s only a borderline case for the Moocher Hall of Fame, he’s a perfect example of eroding social capital. He’s a dirtbag who decided that it is perfectly okay to scam off taxpayers. When enough of his fellow citizens make the same choice, a society is in deep trouble. For the past several years, on the issue of jobs, I’ve focused more on the employment-population ratio rather than the official unemployment rate. Both figures are important, of course, but I think the employment-population ratio has more economic meaning since our prosperity ultimately is based on how many people are productively employed. 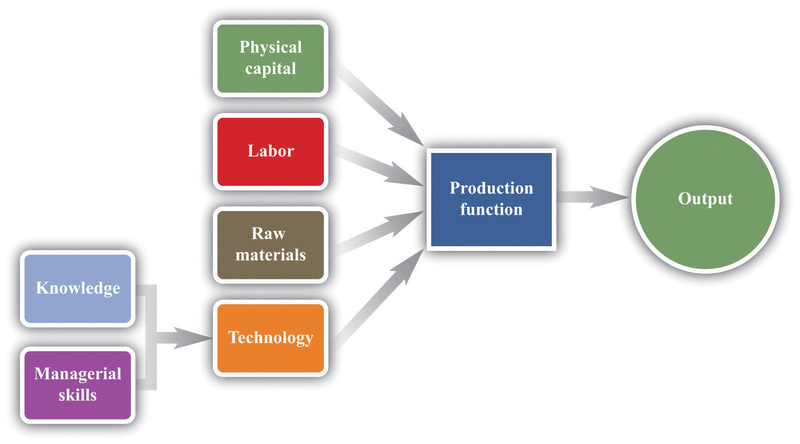 To put this in wonkish terms, our national economic output is a function of the efficient allocation of labor and capital. The reason I bring this up is that many people think the job market is now in great shape because the unemployment rate has dropped to 5.6 percent. To be sure, that’s good news when compared to the much higher rates of joblessness that plagued the nation a few years ago. But one of the reasons the unemployment rate has dropped is that many people have left the labor force. Here’s a chart based on data from the Bureau of Labor Statistics showing how many people have jobs compared to the working-age population. As you can see, there’s been scant improvement in this important indicator. The problem isn’t that the ratio plummeted during the downturn. That always happens. What’s worrisome is the fact that there wasn’t a bounce back in the right direction after the economy started to improve. Indeed, it’s become such a problem that the establishment media has started to notice. Here’s some of what Reuters reported on Fridays good news/bad news jobs report. …wages posted their biggest decline in at least eight years in a sign the tightening labor market has yet to give much of a boost to workers. …The jobless rate fell 0.2 percentage point to a 6-1/2-year low of 5.6 percent, but that was mainly because people left the labor force. The drop in labor participation and a surprise five-cent, or 0.2 percent, decrease in average hourly earnings…the labor force participation rate, the percentage of the working age population who either have a job or are looking for one, dropped back to the 36-year low of 62.7 percent reached in September. The labor force participation rate, which is mentioned in the Reuters article, is another set of data that is rather similar to the employment-population rate. Here’s a chart that’s been circulating on Twitter, based on data from the St. Louis Federal Reserve. You can see that the labor force participation rate jumped significantly between 1970 and 1990, in large part because more women were entering the job market. But in recent years, the trend has been in the wrong direction. And if you parse the data, you can see that the big problem is among those without a college degree. Now that we’ve cited lots of data, let’s speculate on why we have fewer and fewer people productively employed. There are several possible answers, including the big increase in people scamming the disability system. There’s also the jump in tax and regulatory burdens, though that presumably impacts all economic statistics. Obamacare deserves its own special mention since it imposes a significant penalty on work. And, until recently, the government had a policy of endless unemployment benefits that made work relatively less attractive. So the bottom line, as you might expect, is that the problem is too much intervention and bloated government. Which means the answer is free markets and less government. P.S. Some readers will have noticed that this piece cites both the employment-population ratio and the labor force participation rate. These two data series are sometimes used interchangeably, though I prefer the former for reasons explained in this article for the BLS’s Monthly Labor Review. P.P.S. If you want a humorous take on labor economics, I recommend this Wizard-of-Id parody, as well as this Chuck Asay cartoon and this Robert Gorrell cartoon. P.P.P.S. 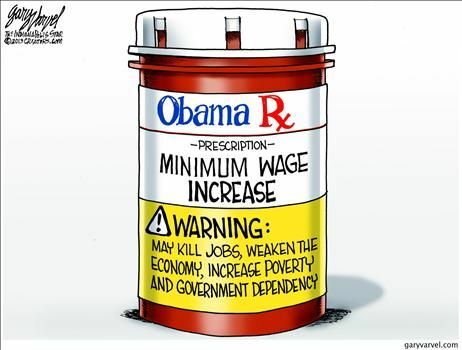 To end on a glum note, Obama wants to increase the minimum wage. You don’t need to be a rocket scientist to know whether that’s going to help or hurt the job market.